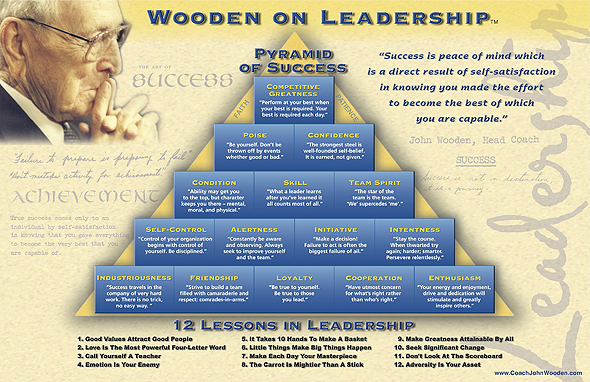 John Wooden, generally acknowledged as the greatest college basketball coach ever, may also have been the greatest US coach of any major sport at any level. His teams won 10 NCAA championships over 12 years. No other coach has won more than 4 over an entire career. Wooden had been a great college player and a very good coach for two decades. But it wasn't until he challenged his own coaching methods in his 50s and put together a unusual, non-traditional team that he became a *great* coach. UCLA today is known for basketball, but when John Wooden took over as the Bruins' coach in 1948, the school had only three winning seasons in the previous 21 years. Over the next 14 seasons under Wooden the Bruins racked up winning records every year. Still, they hadn't ever won even a single NCAA tournament game. In 1961, Wooden concluded that he was too stuck in his ways and not willing enough to change. He decided to get rid of "yes-men" and hired a smart, argumentative assistant, Jerry Norman, who as a player ten years before, had "given him fits"! (Wooden once kicked him off the team for two weeks.) Together they rethought the team and their game. Later on, UCLA would win championships with dominant 7'0" centers. But they won their first championships with with quickness, teamwork and innovation, i.e., a novel zone press that "would sow disharmony and disunity" on the opposing team. The 1963-64 team with no player over 6'5", regularly gave up six inches or more at every position! The five starters consisted of a sprinter, a volleyball player, a playgrounds passer from Philadelphia, a 5'8" 120 lb sharpshooter, and a poker-playing Brooklyn-sharpie who called the very formal coach "J-Dub" or "Woody" to his face. Heavy underdogs against Duke in the championship game (despite an undefeated record! ), they pulled away with three steals, several blocked shots, and 16 straight points in two-and-a-half minutes at the end of the first half.